KUALA LUMPUR: Sabah Chief Minister Datuk Seri Shafie Apdal said yesterday that the project delivery partner (PDP) model will no longer be used for the RM29 billion Pan Borneo Highway project, confirming a front page report by The Edge Financial Daily yesterday that the PDP model will be ditched for the project. According to news reports, Shafie told reporters in Kota Kinabalu that an agreement has been reached in a discussion between the state government, Finance Minister Lim Guan Eng and Works Minister Baru Bian, that the PDP model will not be used to ensure a more efficient and accountable management of its construction cost. “We discussed it at length with our colleagues in Kuala Lumpur, together with Finance Minister Lim Guan Eng and my friend from Sarawak [Works Minister] Baru Bian. “I think we have reached an agreement on certain approaches to ensure that we can cut short [the construction time] and manage how we build the roads without the involvement of private sectors like the PDP,” he was quoted as saying. He also stressed that the highway project needs to be managed transparently as it is important that the people benefit from its construction. Meanwhile, when at Parliament lobby yesterday, Deputy Works Minister Mohd Anuar Mohd Tahir did not confirm nor deny The Edge Financial Daily’s report, saying instead that the cabinet will make a decision on whether to change the PDP model for the project by the end of this month. Mohd Anuar told reporters that the government will ensure that the outcome will be a win-win solution for all parties. 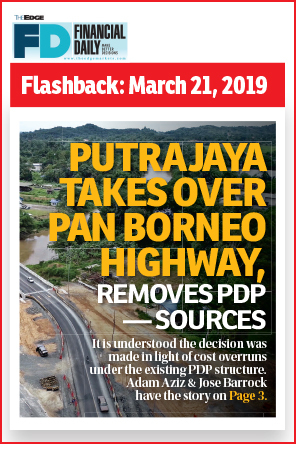 “By the end of March, the cabinet will make a decision relating to Pan Borneo (highway project). So, until the decision is announced, all speculation remains speculation. I cannot and don’t have the right to say anything ahead of the cabinet. It is just a few days away to the end of this month. By end of March, a firm decision will be made. [Meanwhile] we will continue on whatever negotiations we are having now. “Our country requires negotiations, between the federal government, represented by the Works and Finance ministries, and the state governments. So, we will negotiate until we achieve a win-win solution for all parties, including the people. I personally cannot express my view on this project because, as a government, we have to come out with a collective decision, especially a government [that] is formed under a coalition,” he added. Yesterday, this newspaper wrote, citing sources, that the federal government has decided to ditch the PDP model in favour of the turnkey contractor model to complete the remaining construction work for the 5,324km project, and that the works ministry will be taking over the project.